Happy Day After Halloween! Hope you had as much fun as we did. We always have the neighbors over for pizza and then we all walk around with the kids. It's so exciting to see their eyes light up at all of the decor and at the costumed kids they see walking down the street. Halloween is a big deal in our neck of the woods. I have a card to share with you today. 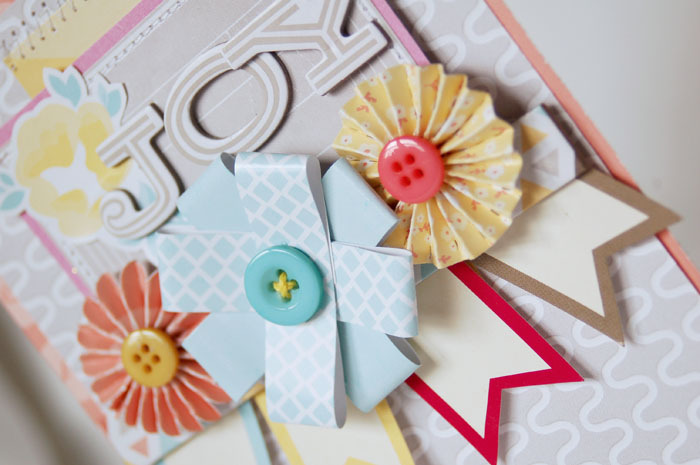 This one uses some awesome American Crafts goodies from the Peachy Keen Fellow line. I made it for Emma's last week. Aren't those flowers fun? I love Thickers and these might be my new favorite! I also wanted to share about My Scrapbook Nook's blog hop. There are lots of great prizes and tons of inspiration! Check out the thread HERE to find out how you can play along. You may have to sign up on the message board, but it's totally worth it! That's it for today. More soon! Thanks for stopping by! It's a Crate Kind of Day!